Do reptiles sleep like mammals and birds? A behavioral and electrophysiological study of the black and white tegu Salvator merianae. Abstract: Two sleep states, slow wave sleep (SWS) and paradoxical sleep (PS) have been identified in most mammals and birds. Non-avian reptiles share a common ancestor with mammals and birds. As a consequence, they are key taxa to understand the origin of sleep states. The squamates (lizards and snakes) belong to the most basal branch of that group. Therefore, tracing the evolution of the two sleep states by studying species in this group is necessary. However, in lizards, the presence of these two sleep states is still equivocal. Indeed, slow waves or high voltage waves were previously reported both during behavioral sleep and wake. Moreover, previous studies reported periods with eye movements and a wake-like EEG during the rest period, but they did not convincingly demonstrate that these correspond to PS rather than micro-arousals. 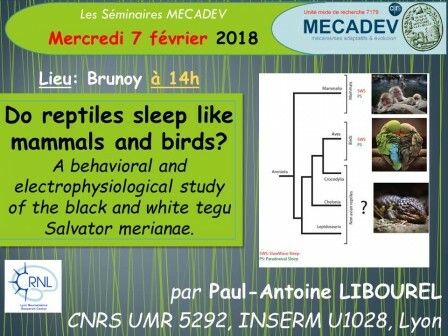 To address this question, we studied sleep in a lizard (Salvator merianae). We simultaneously recorded EOG, EMG, heart rate and local field potentials in the medial cortex (hippocampus homologous), the dorso ventricular ridge (a possible associative structure), and the nucleus sphericus (a vomeronasal structure), under baseline conditions, following sleep deprivation and pharmacological treatment with fluoxetine, a serotonin reuptake that suppress PS in mammals.